I’m a little crisp crazy at the moment. 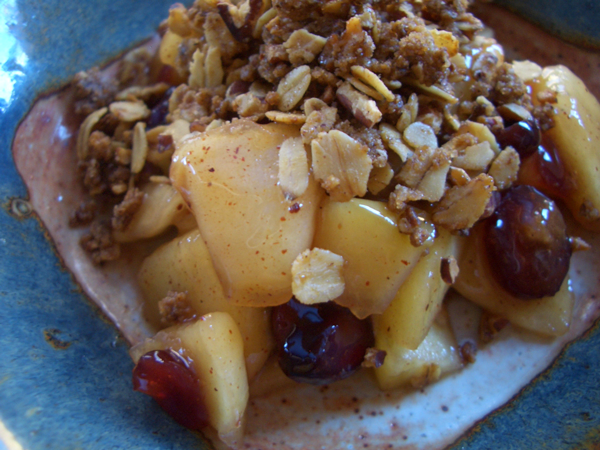 What I found with my last post/recipe is that the topping for my plum crisp keeps really well. So you could make up a batch and keep it around for when you see great fruit in the market and are so inclined to whip up a quick seasonal dessert. This is a cozy little dessert for two. It’s just the right amount of a little something sweet. 1 large apple, peeled, cored, quartered and sliced–use a sweet/tart good baking apple like Fuji, Granny Smith, etc. Add the apple, water, sugar (start with 2 tablespoons/30ml and add more later if needed), lemon juice, cornstarch, cinnamon and salt to a sauce pan. Stir and let sit for 30 minutes. Add the cranberries, bring to a low simmer over medium heat and cook, stirring continuously for about 10 minutes or until the apples are just tender and the syrup is thick. If the syrup doesn’t thicken enough, add another 1/2 teaspoon/2.5ml cornstarch to a little cold water, add it to the apple mixture, and continue cooking until it thickens properly. Ladle the hot mixture into bowls, top with the no-bake crisp topping, and finish with a little vanilla ice cream or sweetened whipped cream. I think topping this with cinnamon ice cream–if you can find it or have the energy to make it–would be amazing.